I read all the reviews on this and weighed the pros and cons and decided to go for it. I'm glad I did because once assembled, this was better looking than I expected. There was no damage, which was one of my main concerns based off other reviews I read. I do agree with other reviews that the instructions aren't wonderful, but we just took our time to be sure we didn't assemble it incorrectly. It does a great job masking the smell and I'm thrilled to no longer have a constant view of the kitty litter box. 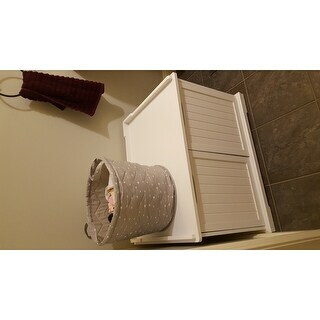 We have this in our laundry room, which has been great because we also place our baskets on it. It has multiple functions now and I love items with multiple functions. Overall, we are very happy with this purchase and would recommend. Place your cat's litter box inside this extra-large cat house to allow her to have privacy when she relieves herself. 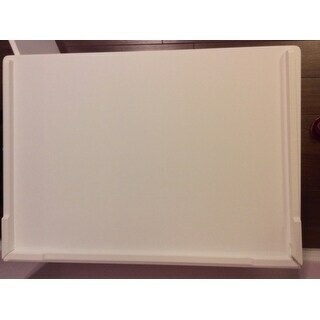 Made from sturdy MDF with a clean white finish, this unit is easy to integrate into your mud room or laundry room decor. 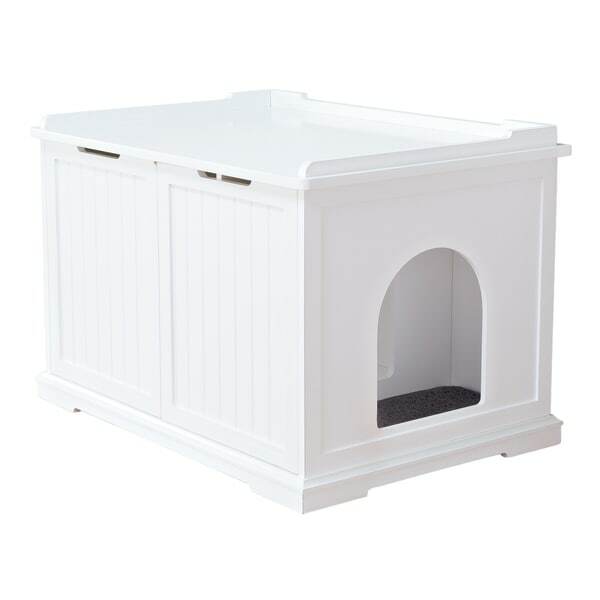 This versatile litter box enclosure can also serve as a comfortable cat retreat when equipped with a padded pet bed. This isn't the highest quality furniture but for the cat houses on the market that I have seen, this one is the best design. The main reason, well there are two main reasons. Reason #1: the doors open in the front, which makes it extremely easy to change or scoop the cat litter. Reason #2: the extra exit door that catches cat litter from the cats paws before he exits. Now, it does not catch it all but it does a damn good job of catching most of it and I have 3 cats. I would definitely recommend. Great litter box hider! I’m so glad I finally bought this after looking at dozens of reviews. My cat is super picky and will only go to the bathroom in one corner of my living room! It’s been a huge problem. I was afraid she would snub the enclosure because she’s always used an open box, but she took to it right away. I left the doors open for a couple days. Thankfully my little box I had fit inside (without divider). She likes to sit on top and look out the window too. I wish it was a little taller, but works ok for my small cat. It does get messy around it. I have the little catcher pad and another mat outside the little door. It took me about 45 min to put together. What a great product.... it solves the problem of a glaringly obvious litter box in my bedroom, and allows my cat her privacy. It’s easy to clean and I had no problems training her to use it. My Husband put it together in about a half-hour. All of the materials were included, and delivery was earlier than expected. I placed a kitty blanket on top, and she likes to rest there. Thanks! I would have given this wooden cat house and litter box a five star rating but the one I received had several flaws in the top piece. There was a large gouge out of the wood on one side and the frame around the top was atteched crookedly leaving a half-inch gap where the two pieces of wood should've met on the back corner. It seems fairly well made overall but just careless workmanship on the top piece. I thought this box would be large enough to house my Scoop Free automatic litter box, but it just didn't fit. The doors fell off as soon as I tried to put the box in it. I ended up removing the doors completely, and now the box fits pretty well. I think it would fit a small litter box OK. Easily fit a jumbo litter box for my two kitties, super easy to put together too! I like that it opens from the front, makes it really easy to change the litter. A little bit of a puzzle to put together but so worth it. Cats are great about using it and it “helps keep the boom out of the room”! Very happy to finally get our litter box tucked out of sight. Since our litter box was on the large side we did not install the interior pass through and it fit perfectly. Also we have a male cat and found that putting a pee pad under the litter box helps protect the interior finish. Fairly easy to put together, no issues there. I wish I bought this sooner. I absolutely love it! It looks great, the quality is good. It was easy to put together. I have a large size litter box inside it. The liitterbox had a detachable high side guard on it. I had to take that off, but it really wasn't needed anyway. What litter does come out of the litterbox stays inside the cat-house and I either sweep or vacuum it out. Easy, keeps litter contained and box put of sight. Nice! We need a smaller cat pan .....so the cats have more room to drop the litter off their feet before leaving box. Other than that the quality is fine for a cat box! I was struggling with litter being everywhere! Thais has been amazing. Our cat went right in and has had no issues and the extra space ensures the litter stays where it needs to be! I really love this product. It was easily put together and the options for configuration were great. We chose to have the entrance separate so the excess litter would stay in the box. It works perfectly and looks like a piece of furniture. It looks great in my half bathroom and keeps my dogs out of the litter box. Nice litter box. We we looking for something that hide the box and this did the trick. I was concerned that our cats would be afraid to go inside of it, however they love it. Assembly - does not line up. Holes for back panel were large and screws don't fit in them. I tried to make it fit and it didn't work. middle divider holes don't line up. Working with customer service to get new parts and hopefully get this thing put together. Not great quality, but I expected that. Putting it together was awful without any help. Also it smells terrible--I think it's paint? It's freezing here, but I'm going to need to open the window to get the smell to dissipate. It's been 24 hours and it still smells like chemicals in the bathroom. Overall, it does the job if you can get it put together properly. I don't expect it to last very long, definitely not through a move. So just keep that in mind! "is this sturdy enough for people to sit on? how much weight can it hold?" ""What are the interior dimensions of the larger area where the litter box goes?" The interior dimensions are approximately 18 inches x 18 inches. I would think since you are putting this together you could leave that piece out. "Do you have to install the center divider?" "What are the interior dimensions of the larger area where the litter box goes? Also, is the dividing "wall" removable?" "I need the door opening to be on the left side. In picture it is on right side. is the door interchangeable"
I would think when you put it together you can reverse the sides. I have been looking for a way to not feature the litterbox & it was a great price! My cats and I are getting too old to go up and down cement steps to the cellar so I need something nice to put in the main living area. Hope this does the trick.